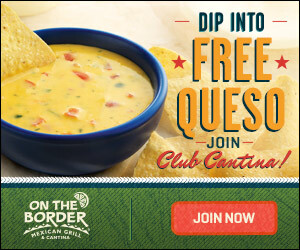 Sign up for Club Cantina and as a thank you, you’ll get a coupon valid for a FREE bowl of queso! You’ll receive offers for free items and discounts throughout the year as well. I just received another one for free tacos just this morning! Head to On the Border to sign up!